“There were 11 heroes in Guingamp colours on the field because organizing a match in these security conditions, when the safety of a certain group is not assured, is catastrophic for football,” Guingamp’s Bernard Desplat told RMC after the match on Thursday. “These are not fans, they are militiamen. Restarting play? How do you expect the players to focus on their game? It was extremely dangerous. This match could only have happened in Ukraine under these conditions,” he added. The Frenchman added that he had utmost respect for the host team and believed that their 3-1 victory in the Europa League match was well deserved. But the Guingamp boss said that his club would complain to UEFA. The clashes started some 15 minutes from the end of the match, when a group of Ukrainian football fans ran into the running lanes and tried to force their way through to a small group of Guingamp supporters. Stewards intervened, and a brawl ensued. 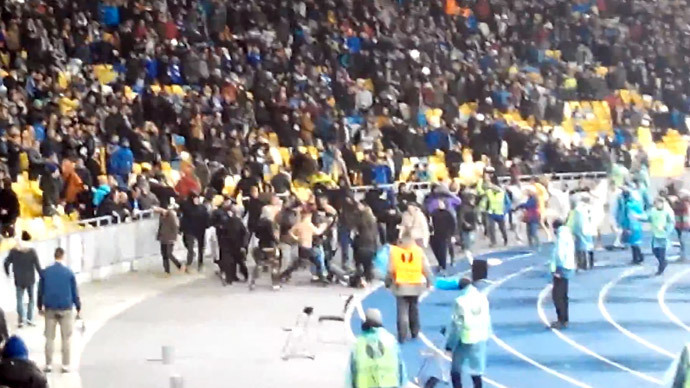 The Dinamo Kiev goalkeeper, Aleksandr Shovkovsky, went into the crowd, trying to persuade supporters to stop the violence, but ended up protecting a steward who had been knocked to the ground. The referee ordered the players back to their locker rooms, where they remained for some 10 minutes. It was not immediately clear what triggered the hooligan attack. FC Dinamo Kiev cited eyewitnesses who said that French fans raised a “foreign nation's flag,” and added that further investigation was necessary. A Ukrainian MP from the Radical Party claimed that the French were “supporters of Marine Le Pen” and that they raised a banner calling Crimea part of Russia. “Of course Dynamo's ultras, many of whom went to war or are at war with the Russian occupants in the east, could not ignore such disrespect from the Russian hirelings among the French fans," Igor Mosiychuk wrote on his Facebook page. He added that three Ukrainian fans were detained by the police and demanded that the Interior Minister Arsen Avakov immediately ordered their release. Prior to the Kiev match, Guingamp advised its fans not to go to Ukraine.